First appearing in the 1400's, Tarot Cards are some of the most powerful divinatory tools known. Using the 22 cards of the Major Arcana and 56 cards of the Minor Arcana, Tarot Cards perhaps allow the reader to gain insight into the past, current and possible futures, explore the occult and maybe even cast spells. My Tobacconist has a wide variety of the most powerful and popular decks such as the Rider-Waite, the Tarot de Marseille, the Universal Waite and the Swiss Tarot. We also offer easy to learn and decipher decks such as the Starter & Classic Tarot decks, the Tell-Me-Tarot, Quick & Easy Tarot and the Tarot for Dummies. 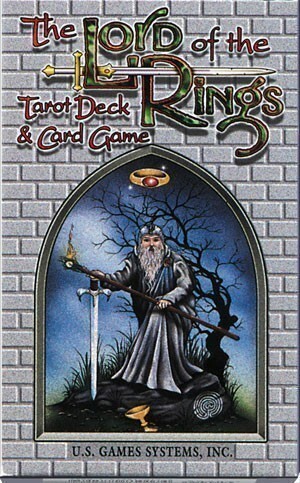 Additionally, we have more artistic decks like the Undersea Tarot, the Lord of the Rings Tarot, the Celestial Tarot, Dragon Tarot, Deviant Moon Tarot, Halloween Tarot & others. We also have more occult esoteric decks such as the Golden Dawn Tarot, Tarot of Sephiroth, the Goddess Oracle, Tarot of Thoth and others. 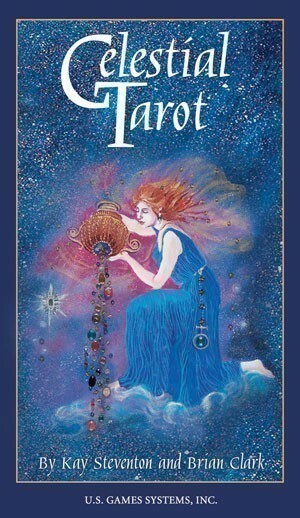 Listed below is a partial list of the many Tarot & other divinatory card sets we carry. 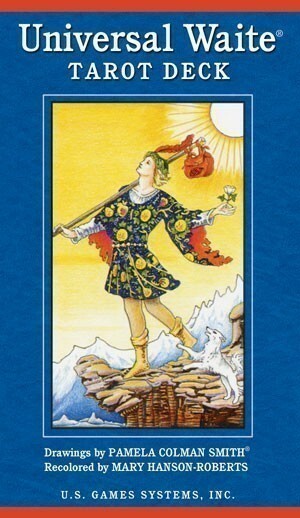 Celestial Tarot is both a handbook of the heavens and an oracular guide to the inner life. The twenty-two cards of the Major Arcana are represented by the twelve zodiacal constellations and ten planets. Each minor suit represents one of the four astrological elements. The accompanying booklet introduces the greater mysteries with a chart of astrological and elemental correspondences. The descriptions of the cards explore the mythological archetypes represented in the major and minor arcana, brought to life by the exquisite artwork of Kay Stevens. Valenza's booklet gives interesting card descriptions and interpretations, both upright and reversed. The symmetric card backs, showing different phases of the moon, allow for reversed readings. 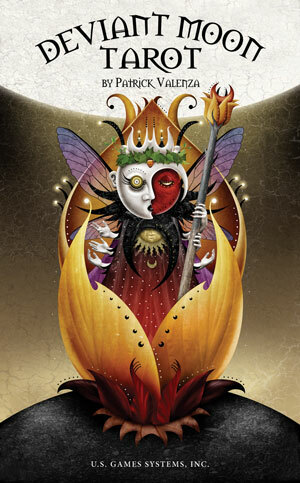 Also included in the booklet is a unique ten-card spread called the Lunatic Spread, which mimics the shape of the full moon, and derives energy from its circular pattern. With cards painted by Lady Frieda Harris according to instructions Aleister Crowley, this magnificent art deco work contains kabalistic and astrological attributions described in Aleister Crowley's Book of Thoth. The stunning art deco artwork of the Thoth is rich in Egyptian symbolism. 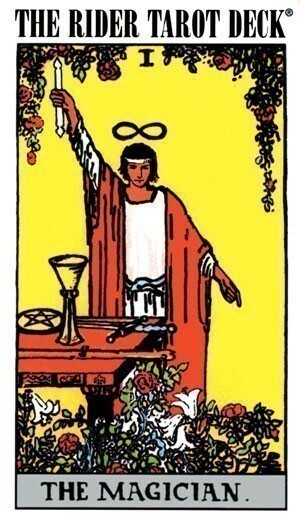 The deck also reflects Crowley's interest in alchemy and magic. 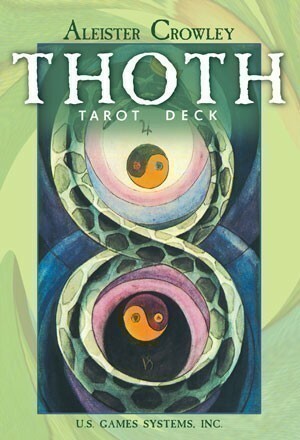 Crowley Thoth Tarot has attracted a worldwide following, both for its striking beauty and for its complex depiction of occult knowledge. Since its initial publication in 1969, the deck has never been out of print. An instruction booklet is included with the deck. 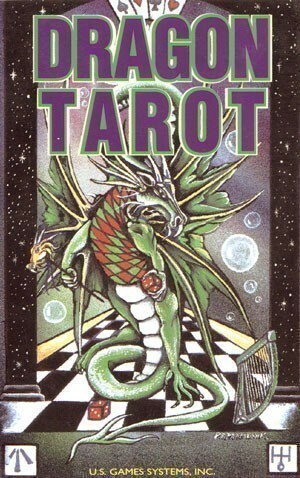 Dragon Tarot draws upon the rich imagery of dragons in all their historical and mythological greatness. The Dragon Tarot represents the fulfillment of centuries of research into the mystic symbolism of dragons throughout the world. This radiant deck brings together the magic and myth from cultures as diverse as ancient Babylon, Egypt, and China. The iconic drawings of Pamela Colman Smith have been beautifully re-colored by artist Mary Hanson-Roberts. The original meanings and rich symbolism of the Rider-Waite artwork come though with greater clarity and fresh, new details. The enhanced imagery make the Universal Waite Tarot deck more accessible to newcomers and more appealing to seasoned tarot readers. Hanson-Roberts' serene colors also make the Universal Waite deck as perfect for meditation as it is for divination. This deck unites two great traditions: the spiritual, mystical tradition of the tarot, and the world of folklore and fantasy which J. R. R. Tolkien brought to life in his timeless works. Every card is a glimpse into Middle-earth with scenes from The Lord of the Rings and The Hobbit books. Instructions are included for a card game for 2 to 6 players. Ages 10 to adult. Based in Viking Traditions dating from the 4th century, these stones inscribed with Runic Symbols are often used for divination and fortune telling. Each stone is inscribed with specific Runic Symbols each of which has a special meaning to be determined by the order and arrangement of the cast stones.